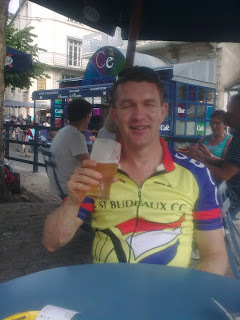 I could say that S had a bad day in the mountains, except that it was PAN FLAT along the Nantes-Brest canal to Carhaix and thencd via the voie verte; so the only explanation is the fizzy plonk we were drinkin before dinner last night. No matter, carb'd up bigstyle on pasta tonight for the last leg tomorrow. 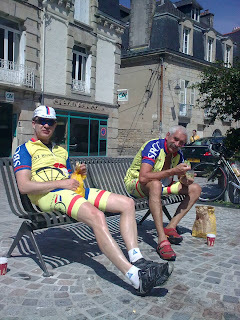 An early off from Josselin (well, 9.30) on a beautiful sunny day and we took the fast road to Pontivy for the inevitable cafe au lait. I convinced S to take the scenic route up to Cleguerec which was still decked out in all it's Le Tour regalia, complete with bikes on lamp-posts and big posters of the French riders. Had a pleasant lunch in the town square where there was a mini statue of liberty. Then up the road (hill actually, still some training for S still required) to our 5 star B&B where we currently sit sipping champagne while watching shorts dry in the Breton sun . . . bliss. Re. earlier post, I fashioned this 'touring with panniers' cup, out of the purest gold, for S.
We left the Loire behind today, on the train to Redon . 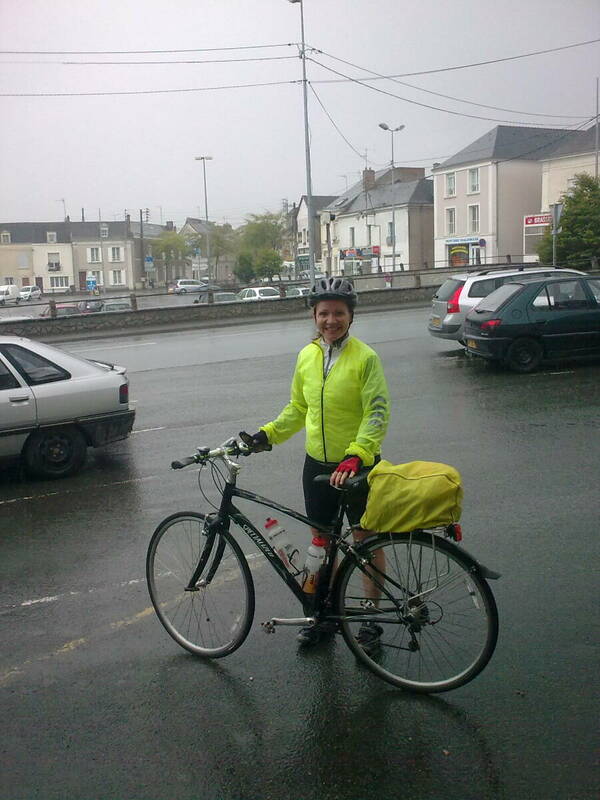 . . back in Bretagne and hills and rain . . . but S is now trained up after days of beasting between caves, and it is sunny! So having succesfully negotiated the TER, we offed to Malestroit where S was in heaven with the long anticipated assiete du fruits de mer, and I gad a can of moules so deep it could have been Tristram cove. 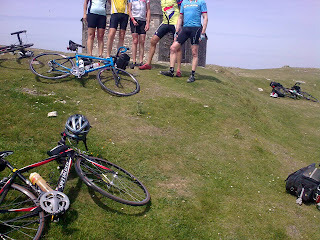 So with a bellyfull of oysters, winkles and muscadet we onlly had 15 miles to go . 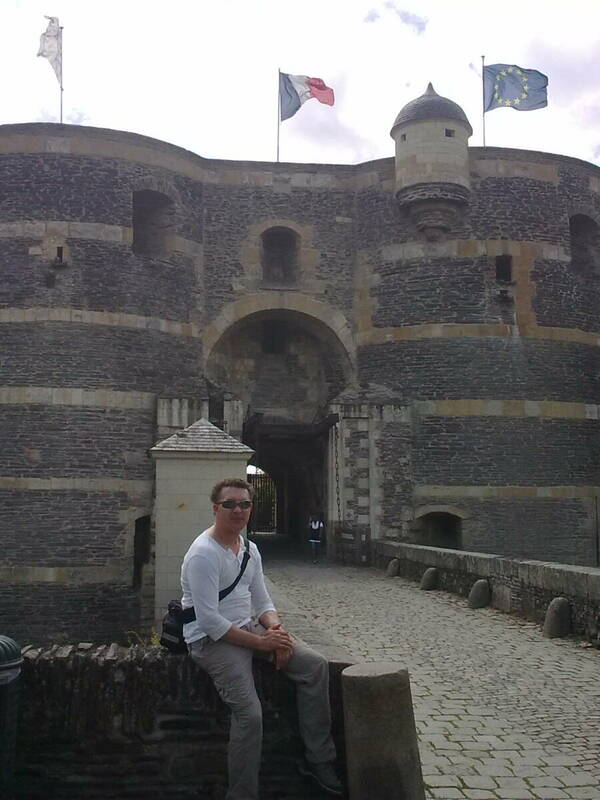 . .
Out and about along the Loire today. The plan was to stock up with lunch supplies at the local supermarket . . . but ferme lundi. 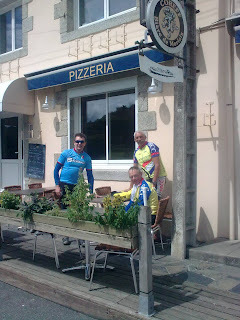 We found another and lunched at St Floret le vieil, which had some connection with Julien Gracq, one of whose books I had randomly purchased at a bookshop in Exeter. Anyway, a meandering loop took us to the Chateau de Serrant, but it was too late to do it justice so we headed off for an early dinner at a nice little restaraunt on the river . . . alas, ferme lundi. So off to Chalonnes, in the rain, which was quite ferme too except for a kebab shop so a large doner, chips and carlsberg it was - bloody good too!
. . . except wash bikes, replace brake blocks, lube chains, extract glass from tyres, superglue same and fix punctures . 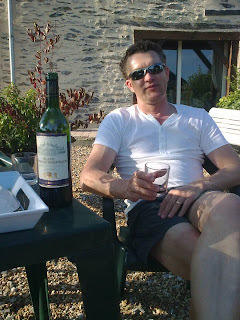 . . then walked along the Loire for wine tasting at local vineyard; felt a bit guilty buying just one £15 bottle (erm, sorry . . . en velo) encased in a gift bag, walked back . . . scoffed it before dinner at riverside restaurant . . . trés bon! After the travails of yesterday a cultural excursion was called for, so we took ourselves off on the train to Angers, the ancient seat of the Dukes of Anjou and Plantagenet French royalty. 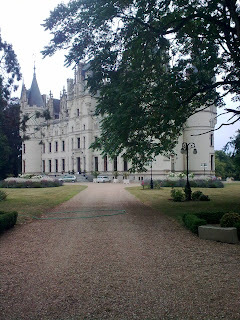 Nice chateau with 100 m medievel tapestry that looked a bit like a large tea towel from a student shared house. Lunch with too much vin and shopping. Back on the road tomorrow to the caves of Saumur (plan A . . . hopefully). Plan A was to visit Tours by train on a rest day, but closer scrutiny of the timetable revealed that the last of only two connections left at 8.46 - and we weren't on it. 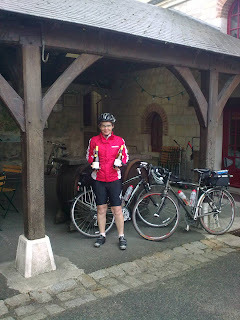 No matter, plan B was put into action, whereby we cycle leisurely between chateaux and vineyards . . . however, I had not reckoned on the immense raw power of the female physique (admittedly when attempting to change down chainrings on a steep hill from a stationary start) as Siân contrived to BEND a sprocket on the middle ring. Adjustment with a borrowed hammer and chisel got us moving again and so on to plan C: spend morning in bike shop trying to source replacement part using pigin' French, but gave up when looking at €50+ minimum spend - big and little rings still ok so wait until return and get one for a tenner! 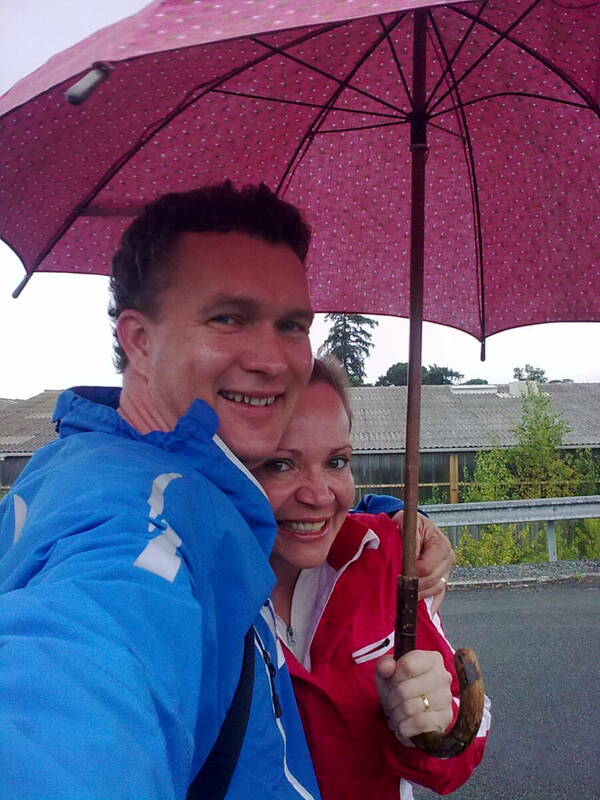 Now it was raining hence plan D - back to B&B and drink red wine . 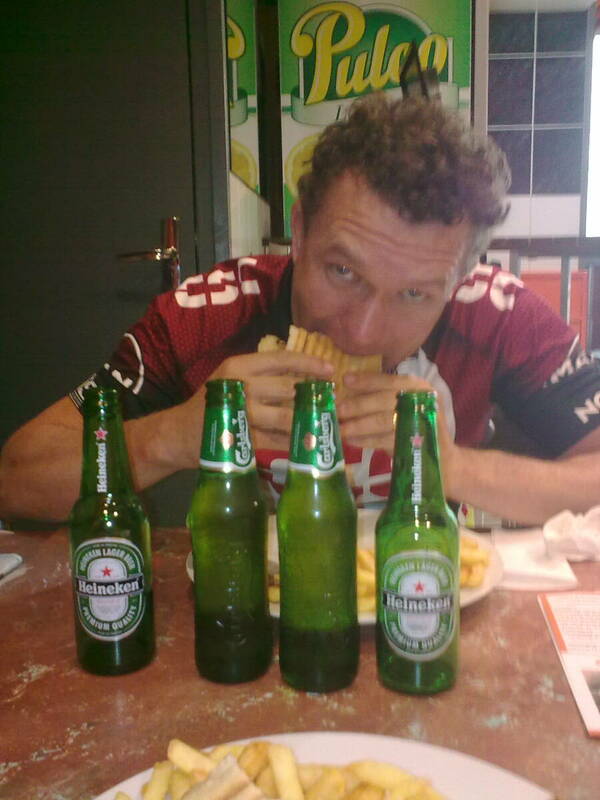 . . the joys of cycle touring on the continent. 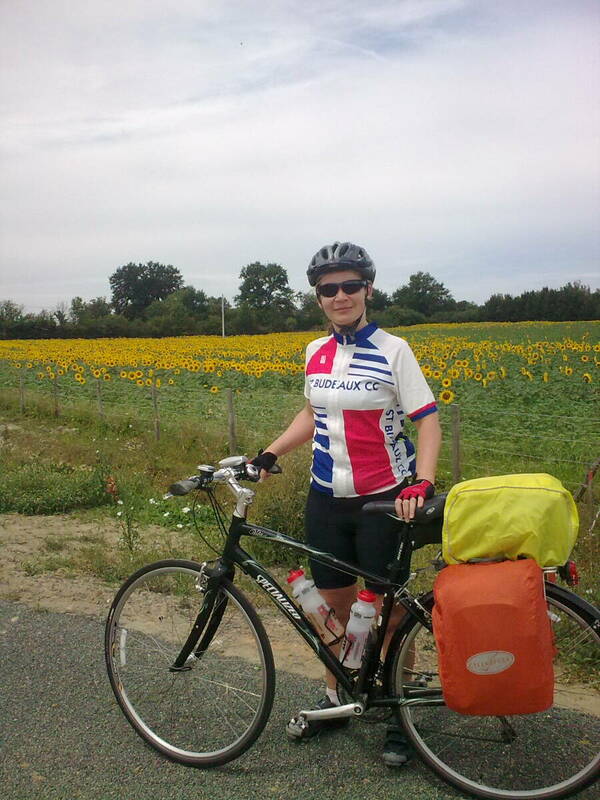 A 70 miler today along the Loire towards Saumur, with stops for lunch, wine and cold beer. Dinner at the riverside restaraunt rounds it off nicely. Rest day tomorrow so Amboise by train. The day started smoothly by catching the TGV from Morlaix to Rennes . . . until we came to get off: the platform hove into view, but on the other side of the train, which is when we discovered that the door was out of order. 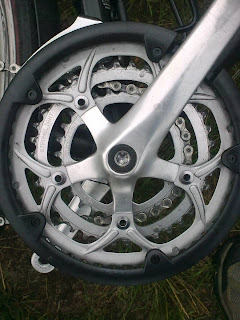 Sian was despatched with panniers to jam her foot in the door at the other end of the carriage while I wheeled bikes through the throng of embarking passengers, figuring (correctly) that the threat of oily chainring and scything pedals would cut a clear path. 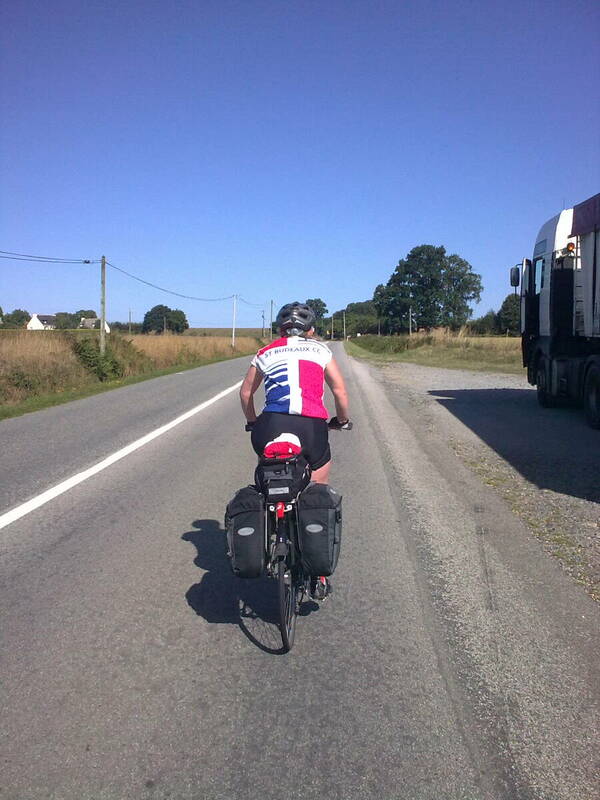 Crisis over, we cycled easily out of Rennes on quiet, flat roads in lovely hot sunshine. 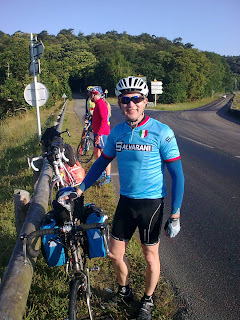 Stopped at Lidl for supplies (some things never change) and on to our lodging, via a cold beer stop, out in the boonies where the emergency food rations and bouteille du vin bought earlier are proving useful. 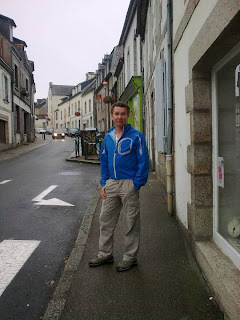 Onwards to the Loire le matin. 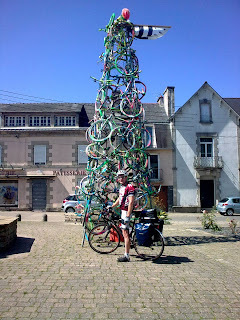 Having arrived en France and fixed my puncture we made leisurely progress to Morlaix to find the festival de terre et mer in full swing. 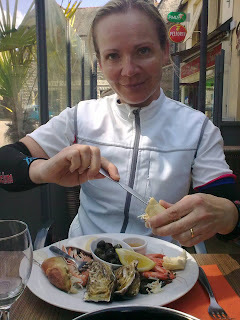 After the requisite stop at the café du choice for recovery drinks we checked in to our hotel, washed shorts, and out for moules et carafe. Tomorrow beckons. Evans on Tour - we're off! A flat front tyre before we even left the house, but it kept enough air to get to the ferry; let's hope for a flat crossing. Left the kids asleep and the house tidy - will it be standing in 2 weeks? 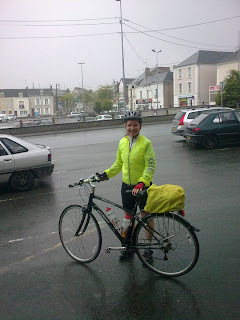 A blustery day of intermittent squalls saw us take to the voie vert to Carhaix, where we partook of the de rigeur café au lait, and thence to the Nantes-Brest canal all the way to Chateauneuf-du-faou where we stopped for . . . yes you guessed it. A bit harsh on the derrier but peaceful and hardly a soul to be seen except the kingfishers and (at one point) the cavalry. Well, the plan was to watch the stage finish at Mur de Bretagne, but the weather reverted to Breton downpour so plan B - feed station at Spezet - was enacted. 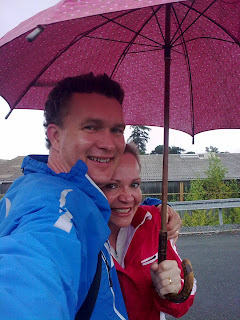 Got there in a downpour. 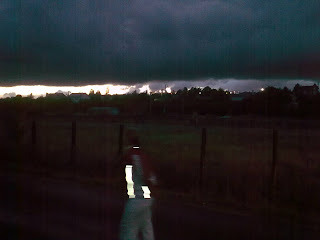 Riders came through and bottles flew, and I managed to beat a little kid and an old bloke to a discarded SaxoBank bidon . . . was it Alberto Contador's?? 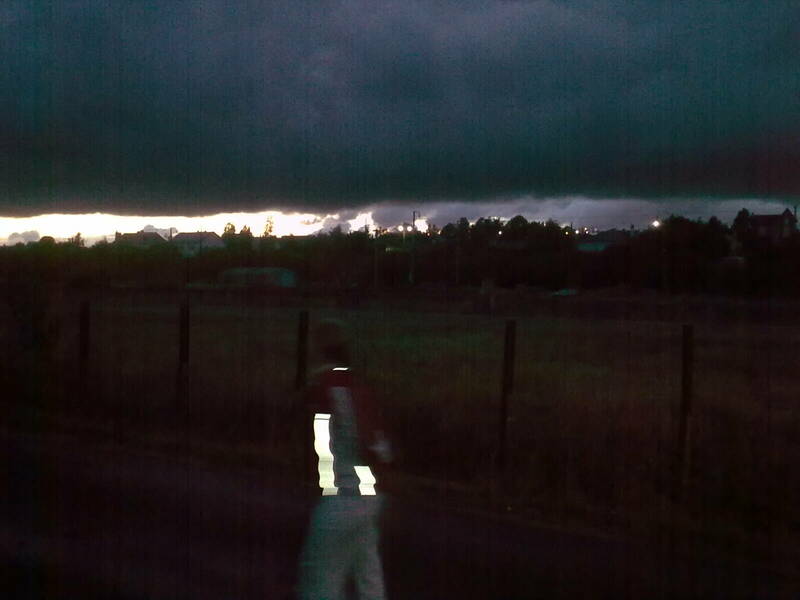 Colin stuffed a discarded jersey down his shirt but was spotted by the team car and had to hand it back. Bells at dawn again, but a late off for an easy day out on the backroads to La Chapelle St Michel de Brasparts, where a kind gent from Somerset took this club photo. . . 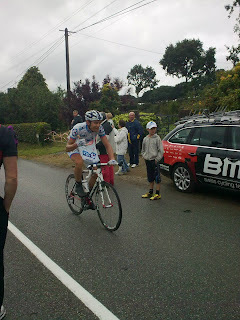 Tomorrow is the big day; off to Mur de Bretagne to watch a stage finish, will Cav get this one? Roused at 7 am by the church bell adjacent to my garret room, it struck me that the church in France must be exempt from environmental health legislation, on sunday au least. Change of plan, went to Quimper in 28 C heat, and found it mostly shut so settled for a baguette. Rolling hills and headwind (both ways? ), 80 miles broken by a cidre stop in Chateauneuf du faou. Knackered! Rose and shone early on the Plymouth-Roscoff ferry and set off after a full english along the coast to Morlaix where we stopped for café au lait. 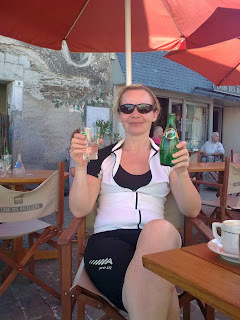 Easy ride to Huelgoat which is a pretty village on a lake with giant boulders. Our £100 per week bargain accomodation turns out ok but I'll update after a night in the dodgy bed. Truite aux amande and cold rosé vin at the Hotel du Lac to round off the evening. 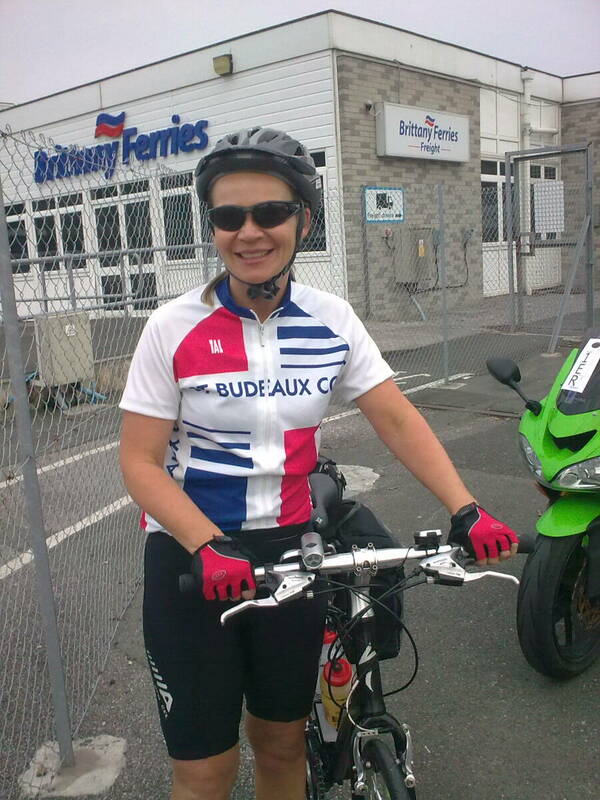 Off to Brest tomorrow. Sun forecast for tomorrow . . moules et frites on the front? © 2013 Velo Shed. Simple theme. Powered by Blogger.